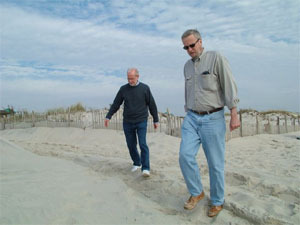 Long Beach Island, on the southern coast of New Jersey in the United States, has been the site of a weekend medium wave-oriented DXpedition held every autumn since 2002. Started by several East-coast DXers, it has attracted attendees from Connecticut, New Jersey, Pennsylvania, and Maryland. The DXpedition is held in a beachfront motel in the town of Ship Bottom NJ, approximately 30 miles north of Atlantic City and 50 miles east of Philadelphia PA.
Long Beach Island itself is a very narrow strip of land about 1 mile off the coast and features a state park and famous Barnegat lighthouse at its northern tip. The island is a popular resort in the summer for nearby New York City and Philadelphia residents, but in November many fishermen can still be seen casting their rods into the surf in search of bluefish, stripers, and other catches. The Drifting Sands Motel, our "DX Inn", is a popular location since it's one of the few beachfront accommodations on the island. The Drifting Sands remains open all year, and underwent extensive renovations in 2004 including the addition of Internet access in the room. Several nearby restaurants, a convenience store, and the all-important Radio Shack (about six miles away) means that we don't have to sacrifice comfort in search of exotic DX opportunities! The location of the motel allows us to deploy beverage antennas on the beach in a roughly north-south configuration. 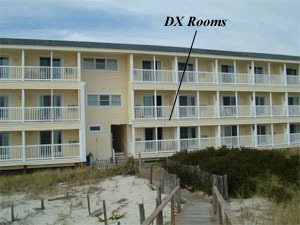 The DX rooms are about 125 feet from the beach, and we run coax feed lines from the rooms to the antennas via a wooden "boardwalk" (New Jersey has strict laws prohibiting walking on the dunes). The antenna wires run in both directions along the base of the wooden fence that follows the dunes. The northern beverage-on-the-ground, or BOG (40 degrees), points directly at the Canadian Maritimes then on to Europe, giving us access to the Middle East and Northern Africa. The southern BOG (220 degrees) points to Central America, giving us coverage of the Caribbean and South America. Since many of the attendees use phasing devices like the MFJ-1025 and Quantum phasers, we also run a shorter "noise" wire parallel to one of the beverages. 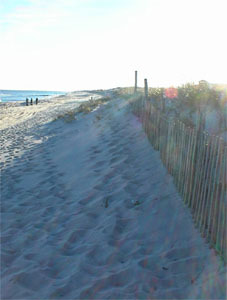 The length of the BOGs has ranged from 500-1400 feet over the years, and is somewhat restricted by the number of vehicle beach access points that the wires have to cross - each crossing means extensive digging to get the wires deep enough not to be disturbed by the weight of the 4-wheel drive vehicles churning through the sand. Total time to deploy the receiving location, including unpacking the equipment and running the antenna wires, averages about two hours not including the time we stop to explain to the local fishermen (or police!) what we were doing. 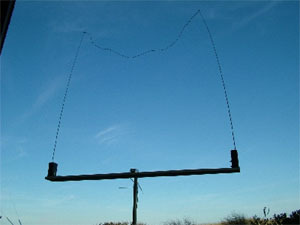 We have experimented with several antenna termination techniques over the years, ranging from an ill-fated attempt at driving a ground rod into the sand to the use of a single ground wire extended off the end of the BOG. We have found the best technique to be a "fan" of three 20-foot long radials attached to the far end of each beverage through a 300 ohm resistor. The reception pattern of each antenna definitely favors the direction they are pointed, so the termination obviously has some effect. The effectiveness of using variable resistors to "tune" the termination has been never been proven worth the time and trouble. In 2004 we added a Mark Connelly-designed rotatable six-foot broadband loop to the mix of antennas. While the strength of the signals from the loop was much lower than the beverages, it was better able to reject domestic stations and provide clearer reception of the Middle East and Europe. In 2005, we added a DX Engineering RPA-1 amplifier (recommended by Mark) to the BBL, and were quite happy with the combination. We also added a sloper, stretching from a third floor room to the beach and aimed towards Africa, but didn't see any appreciable reception in the intended direction; this could be due to the fact that the feed point was at the high end of the antenna. We will likely not be using it at future DXpeditions. Each year's LBI-DXP has yielded very different results due to atmospheric conditions. Propagation at LBI-1 in 2002 (a one-night stand) was very auroral, so few trans-atlantic stations were heard. However Caribbean, southern US and Latin American logs abounded (including one from Panama). In 2003, the DXpedition expanded to two nights (Friday through Sunday), no TA's came in, and we were again limited to stations in the western hemisphere (including four different RJR frequencies from Jamaica). LBI-3 was the real breakout year - lots of strong European higher latitude TA receptions, and a tentative logging of Iran. The 2005 DXpedition also yielded numerous trans-atlantic stations including lower-latitude Europeans, Djibouti, United Arab Emirates, and a tentative Albania. See the logs from each year for more details on what was heard. While LBI-DXP is fairly young compared to other established DXpeditions, we enjoy the camaraderie and opportunities for sharing knowledge that come from spending a weekend together each year dedicated to the hobby of medium-wave DXing, and look forward to future years LBI-DXP.